Flexible working is designed to suit the lifestyles, commitments and preferences of modern employees, but it’s not only the workers who are benefiting. In fact, many employers are also reaping the rewards of being open minded when it comes to flexible working requests. Thanks to flexible working laws introduced in June 2014, all employees who have worked for the same employer for at least 26 weeks have the right to ask for flexible working practices. But what type of flexible working arrangements can be put in place and how are employers and employees benefiting from ditching the traditional 9-5? We are quickly moving towards a world where flexible working is the rule rather than the exception. 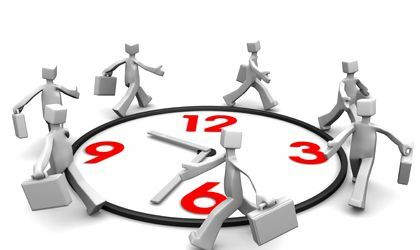 A recent YouGov poll found that only 6 percent of employees are working the traditional 9 to 5, while just 14 percent of employees would opt for those hours if given the choice. Another survey commissioned by McDonald’s found that most full-time workers would prefer to start and finish earlier, with 8am to 4pm and 7am to 3pm the most popular hours to work. A desire to work more flexibly in the future was also expressed by 70 percent of the survey’s respondents, while 65 percent said they felt it would improve their wellbeing and satisfaction at work. Flexibility to meet family needs – Having a flexible schedule means family commitments can be met more conveniently to reduce the reliance on childcare providers and other third-parties. Reduced commuting time and costs – Commuting can be both time-consuming and expensive. Working from home or travelling before or after peak periods can reduce the time, cost and stress of commuting significantly. Increased feeling of control – Giving employees more control over when they work appeals to their entrepreneurial spirit and allows them to work at the times that suit them. Employees can work when they’re at their best – Some employees are at their most productive in the early morning while others might do their best work later in the day. Flexible working allows employees to work when they’re ready to perform. Reduced childcare costs – For young families, childcare costs can account for a significant proportion of their earnings. Having more flexibility about when they work allows parents to put a schedule in place that reduces those costs as much as possible. Increased employee morale, engagement and commitment to the organisation – Giving employees the opportunity to work flexibly shows you care about their well-being and want to help them achieve their goals. That makes many employees happier in their working lives and more committed to the cause. Reduced absenteeism and lateness – In some circumstances, parents have little choice but to stay home from work or put last-minute childcare arrangements in place. Flexible working allows parents to handle their commitments without impact on their working lives. Reduced turnover of key staff – Flexible working is more important to some workers than pay. That means employers could risk losing key members of their team if they’re not willing to put flexible working arrangements in place. The ability to recruit outstanding employees – Offering flexible working when recruiting can increase the number of potential candidates, some of which might go on to become a real asset to your business. Are you ready to ditch the 9-5? At LynxPro, we have a network of sought-after IT contractors and a client base that includes some of the UK’s leading employers. Sign up today to find a flexible working relationship that’s right for you.